is only 26.5 inches, with front and rear fenders respectively four and five inches higher. However, it is possible that the size of the front fenders could bring the center of pressure too far forward, and also that they might have an adverse effect on visibility. One of the most surprising features of the Mark 30 is the use of 13-inch wheels. They are fitted with a new type of wide-section Dunlop R-6 tire-6.00 on 7 -inch rims at the front, 7.00 on 8.5-inch rims at the rear. The speed potential of , this car, certainly over 200 mph with longer gearing, could well lead to overheating problems-in regard to ,braking as well as engine cooling. There is also a possi bili,ty of fron tend lift at high speed, but a model is being wind-tunnel tested at present, and any necessary modifications will presumably be incorporated before the car goes into production. 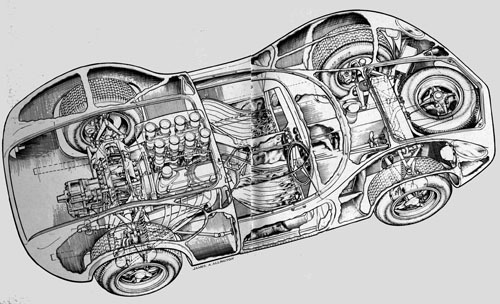 The chassis is of the backbone type, and in principle is similar to that of the Elan. It is made of sheet steel, folded and, welded in to box section, and consists of a central channel, a front cross-member (which provides mountings for front suspension, steering, radiators, and spare wheel) and "wheelbarrow arms" on either side of the engine, the latter being linked' by a removable rear diaphragm which incorporates mountings for the rear suspension and the gearbox. The engine is flexibly mounted, and does not contribute to the overall stiffness of the structure. The interior of the main backbone member is occupied by a 13.5-gallon rubber fuel tank (there are additional 9-gallon tanks beneath each door sill), and extensions beneath it provide for oil and. water pipes, fuel lines, brake 'lines, clutch line, accelerator cable, and electrical leads. Suspension is by double wishbones and coil springs all around, but at both front and rear, the layout differs in detail from recent Lotus practice. The front wishbones are semi-trailing, and at the rear there is a narrow-based upper wishbone and a wide-based lower wishbone. The inboard pick-ups are laid out to eliminate roll-steer, but this could make the car a little twitchy, especially on high speed corners where, most drivers would prefer a degree of roll-understeer. The springs are considerably stiffer, too, to minimize front end lift under acceleration. Roll centers are relatively low, and there is provision for anti-roll bars at both front and rear. Most of the wishbone links are made of folded sheet steel. The hubs are of the center-lock type, and the cast magnesium wheels are vented to direct cooling air onto the brakes. The latter are 10 9/16-inch discs with Girling BR calipers; twin front calipers may be fitted if the normal set-up proves inadequate. The standard power unit is the 289-cu-in Ford Fairlane, modified by Lotus to produce around 350 bhp, and transmission is by a new, heavy-duty 5-speed ZF gearbox/ final drive unit, with a selection of ring and pinion gears ranging from 3.0 to one, to 4.0 to one. The driveshafts have large diameter Metalalastik rubber couplings at their inboard ends. To obtain the best possible degree of air penetration, the 30 has two small radiators (maybe too small in view of the engine's cooling requirements) with separate intakes at either side of a slightly pointed nose; the radiators are carefully sealed to ensure that all the air goes through them. The Mark 30 has not run yet. In fact, the prototype exhibited at the London Racing Car Show was little more than a chassis and body on wheels. However, things can move fast at Lotus, and it is quite possible that the car will be running before these words appear in print. It will probably make its debut at Sebring, driven by Jim Clark and Dan Gurney, and will subsequently be produced at a rate of up to five per week, the price being $8666 in England. A cheaper model with the Lotus-Ford 4-cyl. is also planned. With 350+ bhp (it is not inconceivable that "works" cars will use aluminum or four-cam engines) the 30 should have a very competitive performance. However, it may not have things all its own way in U. S. racing, for there are likely to be several Chevy-engined cars about which will have more power and not much less handling. Riverside, Laguna Seca, Mosport, etc. should be very interesting this year. Brakes. .Girling 10 9/16.inch disc front and rear.